Edelweiss, as its name implies, hints of visions of an Alpine valley full of flowers. This room hosts a four poster full size bed covered with a suede comforter. 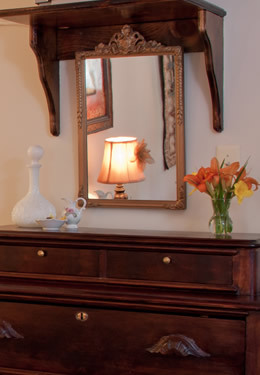 Decorated in taupe and brown and having the cutest lamps featuring beads, feathers and bows on its night tables. 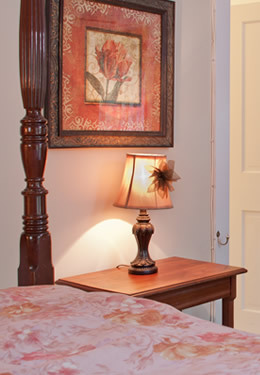 This is one of our coziest rooms located at the front of the inn on the second floor. This room easily accommodates those one or two guests seeking a refuge. Enjoy the rocker while viewing television or reading your latest book. It is also readily available to the rear porch.